The Sutton and District Medical Society is thought to be the fourth oldest of its kind in England. It was founded in 1919 by Dr Arthur Cressy who was a General Practitioner in practice at Wallington Green. His purpose in creating the society was to foster a spirit of mutual help between the G.Ps in the area of Surrey comprising Wallington, Carshalton, Sutton and Cheam. The Medical Practitioners grew in number so a new local War Memorial Hospital was required and built in 1923 in Carshalton. G.Ps became members of the medical staff at this hospital, cared for in-patients and manned a Casualty department. The operating theatre was named The Cressy Operating Theatre. Dr Cressy had undertaken training in both surgery and gynaecology at Guy's Hospital and piloted a succession of innovative procedures for in-patients. He operated on these patients with their own G.Ps assisting him thus providing continuity of care for the patients. On other occasions eminent visiting surgeons were invited to operate in the Cressy Theatre after seeing the patients at home with their G.Ps. These distinguished surgeons had been introduced to the G.Ps through lecturing to the Sutton and District Medical Society. In 1948, the Presidents of the Royal Colleges of Surgeons and Physicians came down to the area from London. At the inception of the of the National Health Service in the same year, many new local consultants were appointed and were invited to join the Society. Until a few years ago, all lectures were strictly medical in nature but, with the widespread provision of Continuing Medical Education (CME) in the local Postgraduate Centres, a broader range of topics of general interest are now covered. Husbands, wives, partners, friends and relations are welcomed guests to the evening meetings. These provide a most valuable local professional network for colleagues and their families. The Sutton and District Medical Society continues to evolve with the changes in medical services and provides an enjoyable forum for updates in professional knowledge and for developing local contacts. The standard monthly meetings are held at Banstead Downs Golf Club, Burdon Lane, Belmont, Sutton, Surrey SM2 7DD England and consist of reception at about 7.15pm, followed by dinner at about 7.45pm, then a lecture, and time for discussion. Members unable to get to the reception and dinner are welcome to attend the lectures. Each year the Society holds a Clinical Meeting at a local centre and also a formal Black Tie Dinner. Penelope B Hewitt, Hon. Sec. Dr James Ness MacBean Ross was a keen member of the Society and President in 1930-31. On his death in 1964 he bequeathed £300 to the Society. This was used by the committee to institute an annual 'MacBean Ross Lecture'. 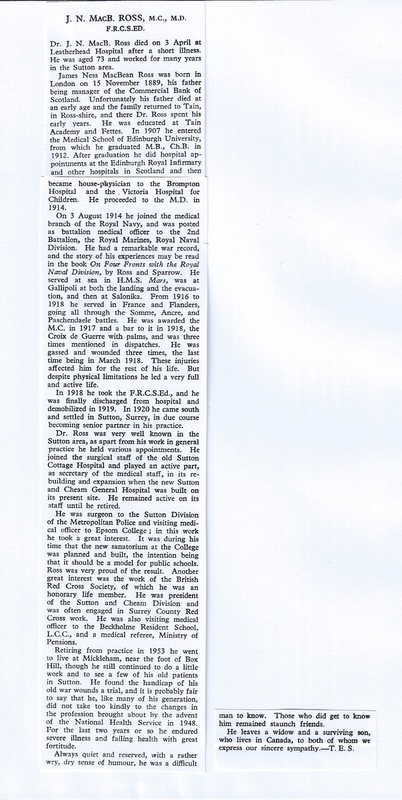 There follows information about him from the local paper and his BMJ Obituary in 1964. There now follows a copy of 'The First Fifty Years of the Sutton and District Medical Society' written by Dr Theodore H. Whittington. As well as being the Society's Archivest in 1969 he had been Secretary for 41 years from the start of the society in 1919 to 1960 and the President on two occassions (1927 - 1928 and 1969-1970). There is no need to click on the blue letters below unless you want to download the contents to your computer and then print them out. The disadvantage is that you get adverts. If you just want to view the contents you can just use the 'full screen' button below the front page and then the scroll bar at the side. Use the 'zoom in' button if you wish to enlarge the print.